Vegetarian Hakka Noodles is a favorite Indian-Chinese dish for most of the Indians.These are the Noodles tossed with garlic and vegetables .I love this dish.Yummmmmmm. 1) Boil 8 cups of water to bubble in a large pan then add a 1 tsp of oil.Drop the noodles and boil them for 5 minutes only.The noodles should be 70 % cooked that means they should be partially cooked or slightly Kachcha.Drain the noodles immediately and spread on plate. 2) Heat oil in wok. 3) Add all the vegetables and stir fry them. 4) Then add salt and black pepper powder and stir fry. 5) Then Add noodles , soy sauce and chilli sauce and stir fry on high fame for 3-4 minutes.Mix well. 6) Serve hot garnished with chopped spring onions. 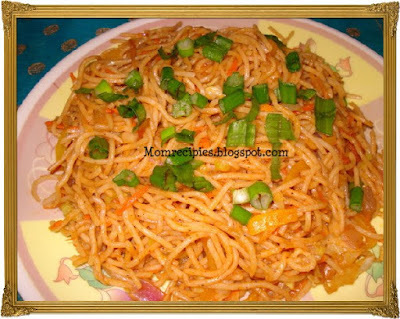 1) Please do not cook Hakka noodles fully, make sure it must have cooked partially or kachcha. 2) Vegetables Should also be not cooked fully .They should be crispy. 3) Instead of Red chilli Sauce you can also use Green chilli sauce. I love Hakka noodles, few days back saw in e.curry also, now i will have to make them soon. This also looks delicous. love this..we used to get tasty hakka noodles in india..long time I had this..